Para completion is nothing except for matching one appropriate line from the options given with the thoughts and sentiments of the author. 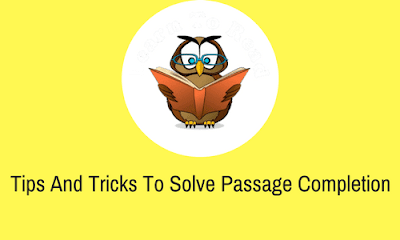 Para-completion requires you to complete the paragraph in a way that it is logically sequential and complete. It tests your comprehension skills. Comprehension means “Reading for Meaning”. Para completion question is often put in the English Language section of several competitive examinations including Bank PO examinations. Short paragraph with a missing sentence is given and the candidates have to choose an appropriate sentence from the given choices to complete the paragraph. The missing sentence can be the opening sentence or concluding sentence or from the middle. The question set in the competitive examination asks you to complete the paragraph by choosing the appropriate line from the options given so as to fit accurately, logically, sequentially and symmetrically in place of the missing line of the given paragraph. Para completion is an art and this art requires your comprehension power as well as practice. Read the paragraph without the missing line and try to find out the inherent message/view/opinion that the author wants to convey. Also try to understand the topic of the paragraph. You must match the subject-matter/topic of the paragraph with that of the options given. Link that very meaning/view/opinion with the options given. The options which totally mismatch are to be ignored instantly. Remember that elimination of options is the best method to solve the question of paragraph completion in a very short time. You may be left with one or two options through this methodology. Of the options left, judge yourself which of the options left matches with the tone of the author. Try to fit those one or two lines one by one at the missing space in the paragraph and judge it on the basis of accuracy, logic, sequence and symmetry. The option that passes these criterions is the right option. Complete continuity of the paragraph is required as a must after exercising the right option in place of the missing line in the paragraph. The paragraph thus duly filled must reflect a complete picture. In recent times, the number of working women has increased considerably in urban areas. With more and more women opting for career-oriented courses, offices and business establishments are flooded with applications from qualified women. (Missing Line is to be completed). Women are working side by side with men in all walks of life. (a) A working woman’s life is not a bed of roses. (b) In fact, there are very few workplaces today which do not have single woman. (c) It is possible to maintain a good standard of living only if the woman contributes to the family’s income. (d) Even in small villages and towns, women are employed. (e) Women are more intelligent than men. Just go through the paragraph attentively and you would easily come to know that the subject matter relates to working women and that too in the urban areas. Option (a) is to be eliminated as the author does not talk about the life of working woman. Option (c) is also to be eliminated as the author does not talk about the reason why women are choosing the career. Option (d) is to be eliminated as the author does not talk about the small villages and towns. Hence we are left with the option (b) and Option (b) is the correct answer which makes the paragraph logically sequential and complete.